A recent study shows that more than half of healthcare consumers research providers online and, with the U.S. Census Bureau estimating a 115% increase in the U.S. Hispanic population from 2014 to 20601, health systems serving diverse populations will need new strategies to engage Spanish-speaking consumers online. ProviderMatch for Consumers in Spanish will help them attract these consumers by presenting Spanish provider profile pages in Google Spanish searches. 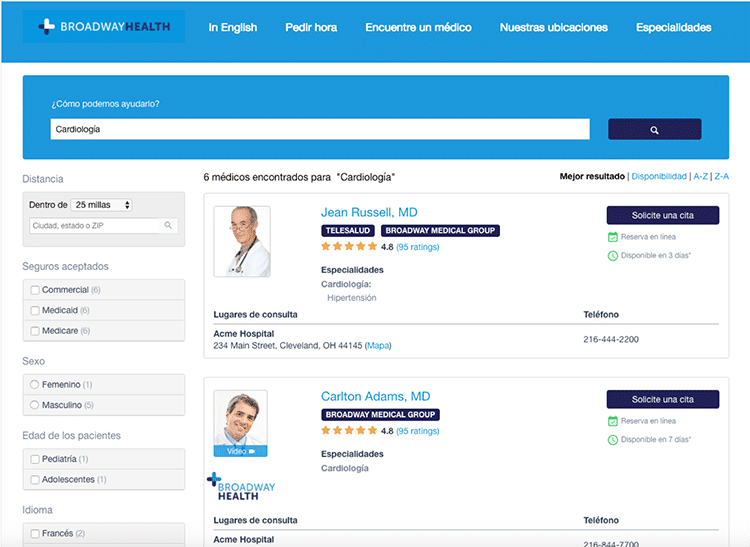 From there, an immersive provider search experience in Spanish and keyword-based searches against translated content from Kyruus’ proprietary clinical taxonomy will support patient demand conversion and retention. 1U.S. Census Bureau, Projections of the Size and Composition of the U.S. Population: 2014 to 2060, March 2015.